Metoprolol is a conventional drug prescribed for hypertension, angina, arrhythmia and heart failure as well as to prevent heart attacks. It relaxes blood vessels, slows your heart rate, improves circulation and lowers blood pressure. Metoprolol may have unpleasant side effects, such as depression, dry mouth, heartburn, nausea, fatigue, vomiting and dizziness. If you suffer from heart problems or high blood pressure, natural herbs may work similarly to metoprolol with fewer side effects. Consult your health care provider before starting herbal therapy. Herbs similar to metoprolol work in various ways. Cardiotonics affect your heart rate and contraction strength, and may be useful for long-term preventive treatment for angina and mild congestive heart failure. Hypotensive herbs act on receptors that control vascular smooth muscles and help dilate blood vessels. Check with a knowledgeable practitioner for advice about dosage and preparation of herbs that are similar to metoprolol. Hawthorn, or Crataegus laevigata, is a shrub with a long history of medicinal use as a cardiotonic. Herbalists use the leaves, flowers and berries to treat many cardiovascular diseases. The main ingredients are flavonoids and procyanidins, which act on enzyme systems and, like metoprolol, correct arrhythmias. In his 2003 book, “Medical Herbalism: The Science and Practice of Herbal Medicine,” clinical herbalist David Hoffmann recommends hawthorn for hypertension, angina and congestive heart failure due to its ability to dilate coronary arteries and improve circulation. Do not combine hawthorn with other heart medicine. Linden, or Tilia platyphyllos, is a European deciduous tree with large heart-shaped leaves and greenish-yellow flowers. Herbalists use the flowers and sapwood to treat fevers, colds, stomach problems and hypertension. The sapwood, or living part of the tree where sap flows, is rich in phenolic acids and polyphenols, and has hypotensive action. Like metoprolol, linden’s relaxant properties improve circulation and lower blood pressure. Herbalist David Hoffmann notes that linden is a tonic for the circulatory system and a relaxing herb useful for hypertension. Do not combine linden with other sedative or heart medication. Motherwort, or Leonarus cardiaca, is a tall perennial found throughout Europe and parts of Asia. Healers use the aerial parts to treat heart disorders and overactive thyroid. The active ingredients include iridoid glycosides and alkaloids known as stachydrine and leonurine, and the plant has cardiotonic and hypotensive action. Motherwort has similar effects as metoprolol on heartbeat. 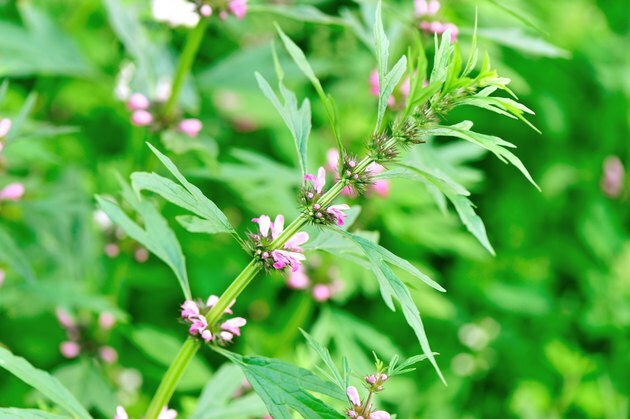 In their 2001 book, “Herbal Remedies,” naturopathic doctors Asa Hershoff and Andrea Rotelli state that motherwort slows the heart rate and normalizes rhythmic disorders. It also improves blood flow, helping to reduce high blood pressure. Avoid using motherwort if you are taking other cardiovascular drugs. Always consult your physician before trying any herbal remedy.